Fragmentation Needed: SDN Themes from ONUG - Community Matters! I was privileged to attend the Open Networking User Group (ONUG) Conference, ONUG Academy and mini Tech Field Day event hosted by JP Morgan Chase on October 29 and 30. I don't know these cats nor the owner of the photo. 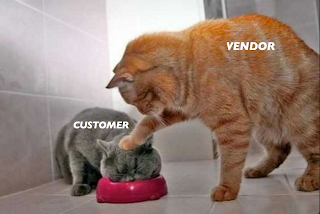 Vendors who are interested in shaping the SDN marketplace and standards bodies around the capabilities of their products, rather than around the problems being faced by their customers. Powerful end users who needed SDN to solve their own peculiar problems. The problems they're solving, and the techniques they're using do not align well with the challenges nor capabilities of mere enterprise users. Researchers, who took SDN in directions that were academically interesting but didn't necessarily overlap with real world problems. ONUG provides a forum where end users of network technology can contemplate the promise of SDN, commiserate about challenges faced, unmask the realities of available offerings, and gain new perspective on the marketplace in a user-centered environment. Without ONUG, we'd be forced to buy what the vendors are selling. ONUG shouldn't be missed because it unifies a potentially vocal community which will shape the SDN marketplace. If you're interested in SDN, you should probably be attending ONUG conferences.